When Fernando Trueba picked up the Oscar for his 1992 film Belle Époque he stated that, as he didn’t believe in God, he wished to thank Billy Wilder instead for helping him win the award. Just a few hours later, Trueba received a phone call from Wilder himself, who famously greeted him saying “Hi Fernando, it’s God here”. The truth is there is a connection between Belle Époque and Wilder’s films, shaped by a wonderful joie de vivre. Belle Époque opens with a young soldier called Fernando (Jorge Sanz) running away in a cold winter night. It is 1931 and as the Spanish Second Republic is about to be installed Fernando has decided to desert the army. While on the run he meets Manolo – a friendly and affable artist – who invites Fernando to take refuge with him at his old house in the country. Fernando accepts and his life turns upside down when he meets Manolo’s four daughters: Rocío (Maribel Verdú), Violeta (Ariadna Gil), Clara (Miriam Díaz-Aroca) and Luz (a very young Penélope Cruz). One by one, the four sisters surrender to Fernando’s charms who, in exchange, will learn all a young man needs to know about romantic love. 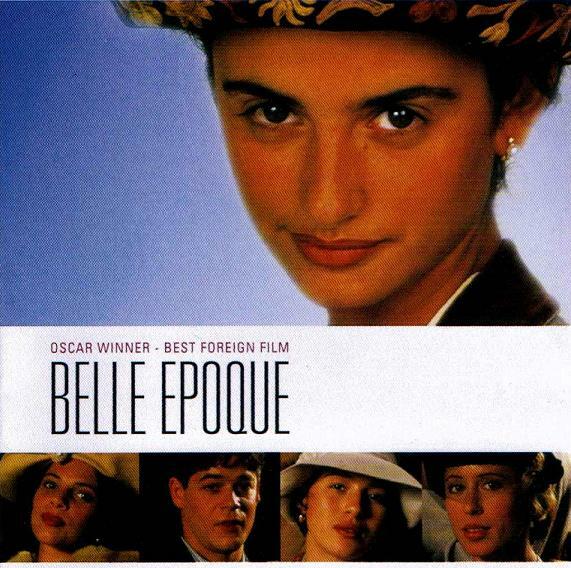 Belle Époque is what some critics would consider “a feel good movie”. Indeed, there is nothing too serious or tragic about Trueba’s story. It portrays a time of peace, joy, sexual freedom and other features that Spain could have benefited from and did not, due the outbreak of Civil War and the subsequent years of hunger and misery. According to Trueba himself, this story was conceived having eleven main characters in mind, all of them taking part in the main plot. It is the way these characters speak, feel, relate and love what really matters, as they kindly invite the audience to form part of their merry, troubleless environment. There is an obvious reminiscence of Shakespearean comedies in the story, and also a constant feeling of playfulness and satire, as anything goes as long as love triumphs in the end. In Belle Époque‘s most famous scene, the four sisters insist on taking Fernando to the village dance – dressed as a woman. In one of the most iconic dance scenes in Spanish cinema, Fernando and a male attired Violeta – a possible homage to Twelfth Night’s Viola, crossed-dressed as Cesario – hilariously perform a Tango, their roles reversed, in front of a very amused audience. This does not seem to bother them though since, after all, “nobody’s perfect”. I have this on my watch list now.